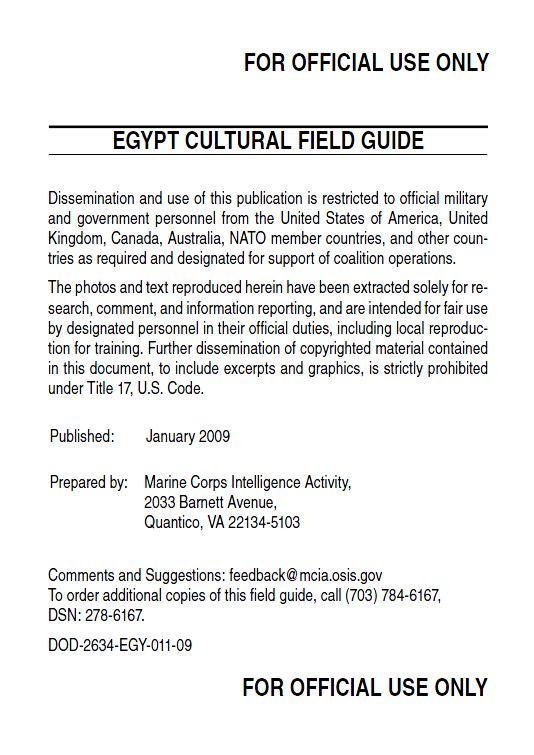 The field guide presents background information to show the Egypt mind-set through its history, language, and religion. It also contains practical sections on lifestyle, customs, and habits. For those seeking more extensive information, MCIA produces a series of cultural intelligence studies on Egypt that explore the dynamics of Egypt culture at a deeper level. Egyptians have one of the strongest senses of national identity of any people of the Middle East. Most Egyptians strongly identify with their Egyptian nationality, their religious faith (both Muslim and Christian), and their connections to all Arab nations. Egypt’s people and history have been shaped by their shared and unique geography. Egypt sees itself as a bridge between Europe and Africa, as well as the east and the west. The country is located in northeast Africa and is bordered by the Mediterranean to the north, Israel and Gaza to the east, Sudan to the south, and Libya to the west. Upper Egypt, known as the Sa`id in Egyptian Arabic, is a distinct region of Egypt that stretches for 534 miles (860 kilometers) between Cairo in the north and Aswan to the south and is only 12 miles (20 kilometers) wide at its broadest point. Upper Egyptians have a unique history and culture that date back to the time of the Pharaohs. Although more than a third of Egypt’s population live in Upper Egypt, the region remains significantly underdeveloped compared to Egypt’s north. While improved transportation and communication networks have increased the connections between Upper and Lower Egypt, rural Upper Egypt remains one of the more isolated regions of the country. Egyptian popular culture often depicts Upper Egypt as a poor backwater populated by uneducated, stubborn, and hot-tempered peasants. Popular jokes often depict Upper Egyptians as country bumpkins unable to navigate modern city life and defenders of conservative values on women and religion. These stereotypes are found throughout Egyptian television, movies, and literature. While Upper Egyptians agree that they have a distinct cultural identity, they view their identity through a more positive framework. Upper Egyptians believe that they are hardworking, family-oriented, honest, and pious. DO shake hands in greeting. When greeting a member of the opposite gender, wait for that person to extend a hand. If a hand is not extended, simply nod in acknowledgement. DO inquire about a guest’s health when greeting. DO offer coffee, tea, or soda to your guests. DO offer food and drink to your guests repeatedly. It is common for Egyptians to initially decline offers or refreshments, but accept when pressed. DO walk your guests to the door when they are leaving. DO bring a gift of chocolate or flowers when visiting a home for a meal or when visiting a sick friend in the hospital. DO compliment your hostess on her culinary skills and expect to be offered a great deal of food. DO dress modestly; neither men nor women should wear shorts. Women should not wear sleeveless or low-cut tops. DO wear black and talk in a soft voice when attending funerals. DO NOT sit crosslegged or smoke in front of elders. DON’T be surprised to see men holding hands on the street, as this is merely a sign of friendship. DON’T show the bottom of your feet or shoes to an Egyptian or leave your shoes turned up-side down, as both are considered highly offensive. DON’T throw away bread. If given a piece of unwanted bread, quietly give it to another person or place it off the ground in an area where birds can eat it. DON’T watch loud television or make other noise for the first 3 days after the death of a neighbor. DON’T be offended if you are asked about your personal life or finances. DON’T be surprised by Egyptians’ flexible attitudes toward time. Many Egyptians discuss time in terms of afternoon and evening, rather than in hours and minutes. DON’T leave a funeral while a priest or sheikh is speaking. DON’T send a wreath to a Muslim funeral, this is only acceptable at Coptic funerals.